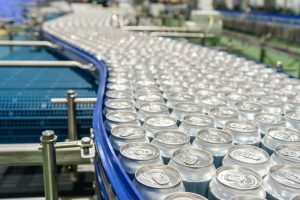 Soft drink manufacturers often rely on the experts at Tropical Bottling Co. to can their ready-to-drink (RTD) beverage products and get them ready for store shelves. Our leadership team has nearly 100 years of combined industry experience, and we can provide best-in-class services, expert recommendations and efficient production runs to help you keep costs down while maintaining a steady inventory of product. Unlike many canning companies, Tropical Bottling Co. is proud to offer a broad assortment of processes to better meet the needs of a wide range of tea, flavored water, sparkling juice, energy drink and soft drink manufacturers. From reverse osmosis water treatment and cold fill to pasteurization and beyond, we have the equipment, tools and facility needed to create top-quality RTD products on every production run. Additionally, we are one of the few canning companies to offer both in-house or 3rd party labeling and custom palletizing so that your products can be ready to store shelves immediately following production. Better still, we even offer warehouse space for the storage of your finished goods and are located near the ports for easy access to export services. Finally, we are a HACCP and Florida Department of Agriculture certified facility, and we have recently earned our SQF Level II Certification for beverage production safety and quality control. For more information about our certification, please read on. Tropical Bottling Co. is glad to work with flavored water, tea, sparkling juice, energy drink and soft drink manufacturers from Florida, Georgia, Texas, Oklahoma, Arkansas and beyond, and we look forward to working with you on your next RTD product. Contact us today to get started!